Have you ever wondered how young purebred dogs wind up in the animal shelter? 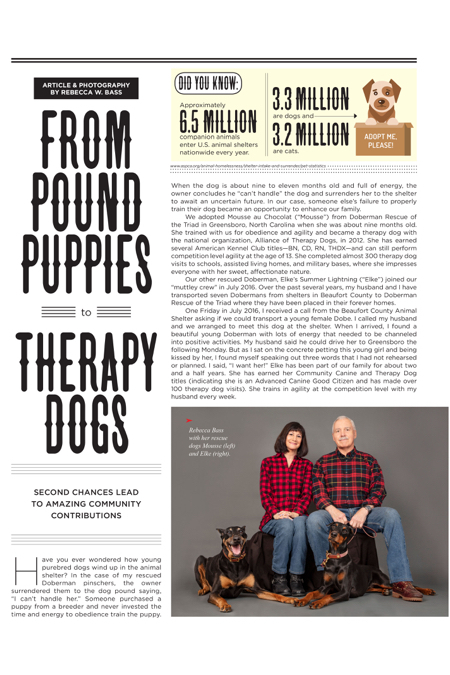 In the case of my rescued Doberman pinschers, the owner surrendered them to the dog pound saying, “I can’t handle her.” Someone purchased a puppy from a breeder and never invested the time and energy to obedience train the puppy. When the dog is about nine to eleven months old and full of energy, the owner concludes he “can’t handle” the dog and surrenders her to the shelter to await an uncertain future. In our case, someone else’s failure to properly train their dog became an opportunity to enhance our family. We adopted Mousse au Chocolat (“Mousse”) from Doberman Rescue of the Triad in Greensboro, North Carolina when she was about nine months old. She trained with us for obedience and agility and became a therapy dog with the national organization, Alliance of Therapy Dogs, in 2012. She has earned several American Kennel Club titles—BN, CD, RN, THDX—and can still perform competition level agility at the age of 13. She completed almost 300 therapy dog visits to schools, assisted living homes, and military bases, where she impresses everyone with her sweet, affectionate nature. Our other rescued Doberman, Elke’s Summer Lightning (“Elke”) joined our “muttley crew” in July 2016. Over the past several years, my husband and I have transported seven Dobermans from shelters in Beaufort County to Doberman Rescue of the Triad where they have been placed in their forever homes. One Friday in July 2016, I received a call from the Beaufort County Animal Shelter asking if we could transport a young female Dobe. I called my husband and we arranged to meet this dog at the shelter. When I arrived, I found a beautiful young Doberman with lots of energy that needed to be channeled into positive activities. My husband said he could drive her to Greensboro the following Monday. But as I sat on the concrete petting this young girl and being kissed by her, I found myself speaking out three words that I had not rehearsed or planned. I said, “I want her!” Elke has been part of our family for about two and a half years. She has earned her Community Canine and Therapy Dog titles (indicating she is an Advanced Canine Good Citizen and has made over 100 therapy dog visits). She trains in agility at the competition level with my husband every week. These amazing dogs are not our first rescues. Our first rescued Doberman was from the Humane Association of Broward County (Florida). CoCo became my first competition obedience dog and a therapy dog. Princess Chloe of Carolina joined our family at the age of three when her humans divorced and could not keep her. She earned many obedience titles and her Therapy Dog Excellent title after making over 200 visits. Titles are fun to achieve, but most important, these dogs have been a part of our hearts and have enhanced our lives beyond measure. In 2015, Ann Cofield of Bluffton found herself “dogless” since she had recently lost her Golden Retriever to old age. On a visit to Hilton Head Humane on a cold and rainy February day, she discovered a one-year-old Beagle/Dachshund with longing brown eyes that said, “Choose me!” How could she resist? She kept the name the group had given her, Swiss Miss, but calls her Missy—a good Southern name. She could not find much about her background but did learn she was a surrender to the Beaufort County Animal Shelter before she came to Hilton Head Humane. “Perhaps,” they said, “she belonged to a Marine who got deployed.” Today, as a member of Alliance of Therapy Dogs, she visits injured Marines at Parris Island each week. She loves the Marines, and we are sure she would join their activities, if allowed. Firecrackers? Thunder? Gun fire? No problem! She is fearless. The Marines are comforted by her unconditional love. Today, in addition to visiting Parris Island, Ann, Missy, and Journey also go to Bluffton Library for the Therapy Dog Reading Program. The dogs love to lie down beside the children while they read. Sometimes the dogs sleep and the children say, “Hey, she’s not listening!” Ann replies, “Of course she is; she is just resting her eyes.” This seems to be an acceptable answer. At night when Missy, Journey, and Ann sit on the couch, her heart is filled with thanks that she was chosen to share these dogs with the world! Mame and Dan Bowser of Hilton Head Island have always included canine kids in their family. In 2016, they decided that their three-year-old German shepherd, Greta, needed a companion. In researching the prospect, they discovered that those who harbored negative feelings toward rescuing a dog actually had no firsthand experience with a rescue dog or rescue organization. When Mame consulted friends who had rescued dogs, she concluded that this would be a win-win. They could offer a loving home to a German shepherd, and they and Greta would enjoy the love of the new, adopted dog. When Mame and Dan fell in love with a one-year old German shepherd named Vinnie, they knew they had an obligation to train Vinnie if he was to become the best dog he could be. Soon after participating in training classes, it became apparent that Vinnie is truly a people dog. This guy has the right personality to bring joy to others, and they decided to share him with those needing a bit of sunshine. Mame and Vinnie are now members of Alliance of Therapy Dogs. Vinnie loves meeting new people at Parris Island, University of South Carolina in Bluffton, and the Technical College of the Lowcountry. People are impressed when they meet the 125-pound tail wagging, smiling Vinnie. The big guy lights up the room. What types of dogs make the best therapy dogs? All kinds—large and small, purebred and all-American mixed breeds. Therapy dogs are not just for visiting older citizens, veterans and Wounded Warriors as they are very engaging when it comes to youngsters. Our local therapy dogs have visited area libraries, the YMCA, Beaufort Elementary, Broad River Elementary, Lady’s Island Middle and St. Helena Elementary schools for our ARF (Animals make Reading Fun) program, where children read aloud to the dogs. The dogs are attentive and comforting, enabling children to read and project themselves with minimal stress and anxiety. These visits are good for the owner-handlers and folks they are visiting and are also good for the dogs. Dogs need a job! These dogs come home tired and satisfied from their worthwhile day’s effort. How Do You Become a Therapy Dog Team? A therapy dog needs to be obedient, have an easygoing temperament, and be relaxed when meeting new people and other dogs. If you have compassion for people and would like to share your well-socialized dog with others, volunteer to bring smiles and joy to members of our community. Contact Rebecca Bass at muttleycrew2008@gmail.com. The requirements for becoming an Alliance of Therapy Dogs team are on their website: www.therapydogs.com. Excellent article by my friend and trainer, Rebecca Bass! Thanks to her, my rescued therapy dog and I continue our team work in Pa. There is no one like her here.